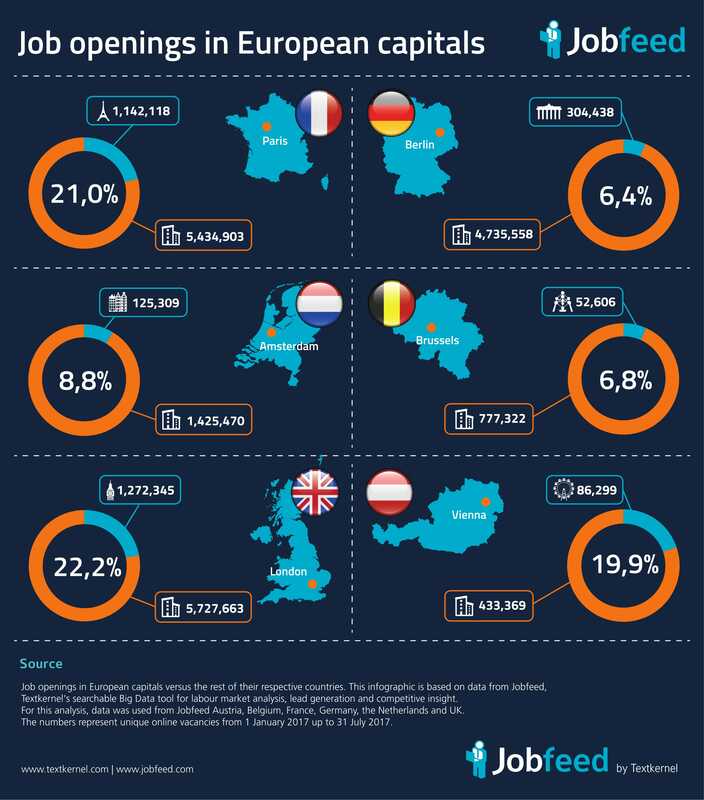 [Infographic] City VS Country: Which European capital concentrates the most jobs? As centers of power and economic growth, capital cities have traditionally concentrated jobs within their borders and suburbs. Moving to the big city is still today synonym with a better chance at getting employed and building a career. But by virtually shrinking physical distances, telecommunications and an ever expanding public transportation network have transformed the way we work. Likewise, the disappearance of physical borders within the European Union has has seen the development of new economic centres taking jobs away from the capitals. With the help of Jobfeed data, we uncover how European capitals fare compared to each other and what is their actual share of the job market is today. You can download a .pdf version of the infographic here. For the .jpg version click on the image below or download it here. In order to measure the weight of European capitals in terms of their share of the job market, we set out to analyse millions of jobs published online and collected by Jobfeed over a 6-month period in 6 European countries: France, Germany, the Netherlands, Belgium, The UK and Austria. Thanks to the build-in Analytics module of Jobfeed we were able to quickly define the perimeter of the areas to be surveyed, select the contract type we wanted to focus on (permanent, temporary and freelance jobs) and extract data from more than 21 millions unique jobs published between the 1 January and the 31 of July 2017. Numbers come from Jobfeed, Textkernel’s searchable job database for lead generation, competitive insight and labour market analysis. Jobfeed offers a current and historic overview of online jobs in the UK as well as in Germany, France, the Netherlands, Austria and Belgium. Jobfeed is a valuable source of information and a unique analytical and acquisition tool for recruitment and staffing agencies, job boards, outplacement and research organisations. For more information or a free trial, please visit www.textkernel.com/jobfeed.